The Joan Oró telescope (TJO) at he Montsec Astronomical Observatory (OAdM) has obtained more than 500 images for Barnard’s star with filters R and I, the reddest ones available at the telescope, and around 400 images for Ross 154 with V, R and I filters (see Figure 1). The TJO has been operating in fully robotic mode with zero problems for a couple of months now! Several nights were lost during the last 2 weeks due to thin clouds or even some rainy weather. Also, some data were removed from the extracted light curves as they were probably affected by cirrus and the closeness of the targets to the full moon. However, most of the data seem to be reliable and the light curves for both targets already show some significant signals. Moreover, the monitoring cadence may be increased for both Red Dots targets as some other high priority campaigns at the TJO have been completed. 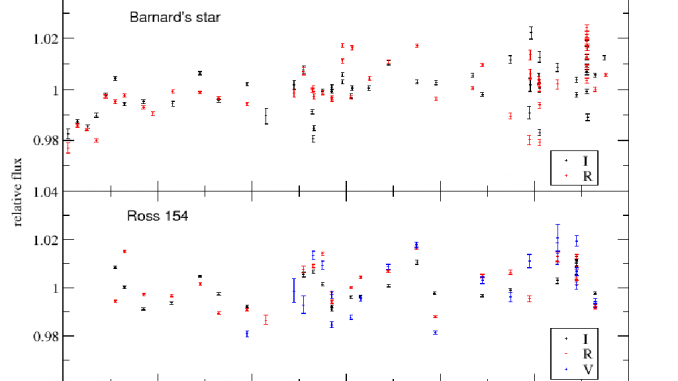 According to the multi-colour light curves, Barnard’s star keeps increasing brightness. Up to 10 data points could be obtained for Barnard’s star on some selected nights, but a lot of scatter appears in the photometry of the last 2 weeks, probably due to the non-photometric conditions. In the case of Ross 154, the three light curves are in good agreement and seem to show some variability signal with ~10 days periodicity (see Figure 1). The TJO will try to keep observing both targets with a cadence of 2-3 data points per night until the end of their observability period. Figure 1. 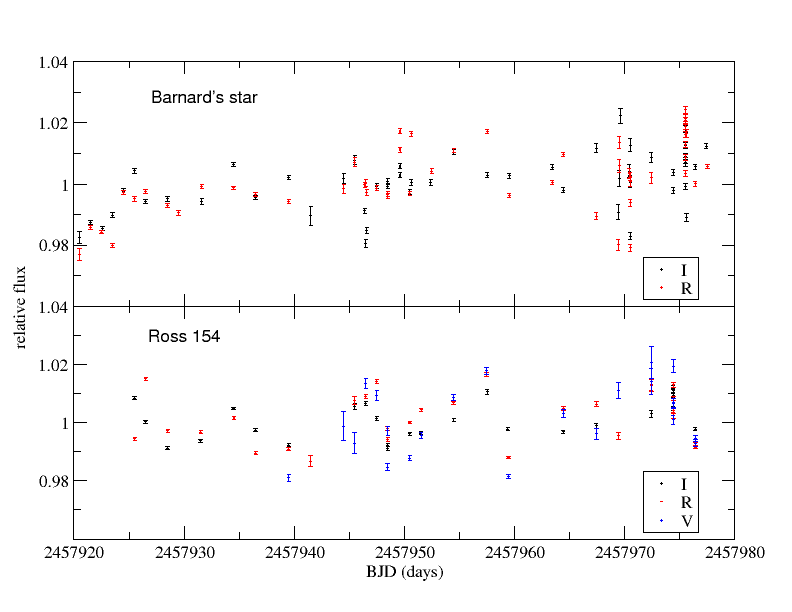 Light curves obtained to date for Barnard’s star (top) and Ross 154 (bottom) at the TJO. Non-photometric conditions could be affecting Barnard’s data in the last two weeks. A previously undetected variability in Ross 154 seems to show up in the data. Some nights were lost at SNO due to clouds, wind and/or dust (it is not unusual that dust from Sahara desert reaches the observatory and the city of Granada). Besides, 6 nights were lost as a result of some works taking place at the dome of the T90 telescope. The good news is that we are back on our feet now! We were doing so good with ASH2! as only 6 out of 50 nights had been lost. But then, we stumbled upon a problem with the electronics and observations had to be stopped since August 7th. We expect the issue to be solved at anytime, and that we resume observations in the coming week.